Note 1: I failed to see what the audiences and the reviewers are so excited about for this movie. I usually avoid negative reviews, but again, like 'Raajneeti', I just had to write this one. Note 2: I am sure a lot of people would disagree with me. If you are willing to spend your time, I would love to hear your opinion in the comments. When you come to know about a movie that will be releasing shortly, and you scrutinize the promotional poster carefully, and see the name 'Anurag Kashyap' printed on the poster, you get excited about it. You eagerly wait for the movie. You are excited for you don't know how the maestro will surprise you this time. It doesn't matter in what capacity is he associated with the movie, his name is enough for creating the buzz. So far so good. 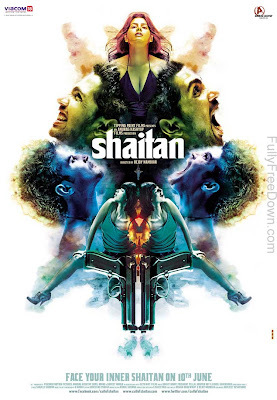 Now, I came to know about 'Shaitan' a couple of months back, and naturally, I was excited about it. I saw the poster, and truly, the poster was remarkable. Then, something happened. Something ominous. 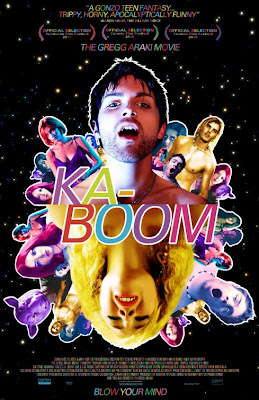 Now, I haven't seen the movie 'Kaboom', and have no idea what that movie is about, but the striking resemblance of the posters seriously pissed me off. Now, there is a specific genre of movies called "Mindfuck". In a good way. [define:Mindfuck - An idea or concept that shakes one's previously held beliefs or assumptions about the nature of reality. (Urban Dictionary)]. When an Anurag Kashyap production has this tagline - "Face your Inner Shaitan", that is precisely what you expect. You know, like 'Black Swan'. Or even 'Gulaal', Anurag's last directorial venture. NOT, to get your mind fucked by an amateurish attempt. There is no underlying prominent theme in the movie. That should have been there. There is NO power-packed acting performance. That should have been there. There is no empathy (or sympathy, for that matter) the audience feels for any of the characters. That should have been there. There is little or no surprise element in the movie. That should have been there. The only thing that should have been there and is there in the movie is the excellent cinematography. When dealing with a subject as complex as 'inner conflict' and the dilemma, the characterization should be spot-on. We should be able to understand a character. What it does, and why it does what it does. It should come down to two simple things - reason, and purpose. And that is where this movie fails so spectacularly. The movie is only brilliant in parts, and those parts are very few and far apart in the movie. I really really expected a lot more out of this venture, and probably that is the reason I am so disappointed. What pains me is that the intended idea was so powerful, that they could have made a masterpiece out of it. But they ended up making it one big mess. Towards the end, the movie is just noise. Annoying, disappointing, noise. The plot holes in the movie are so many that I can't find the patience to sit and write about each one of them, and tear it apart one at a time. Watch this one only to see how even a genius can make a bad bet. When I was in school, I used to particularly enjoy my English classes, only because of the teachers we had. Incidentally, they were probably one of the best teachers I have ever had. One of our teachers kept on reminding us, "You come here to study the King's English. Don't ruin it with your Hin-glish and all the other nonsense you people blabber all day. At least not here inside the classroom." And it was the teaching which got us all interested in grammar. We came to appreciate the beauty of language. 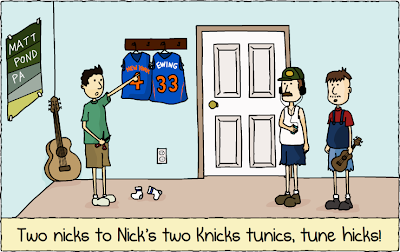 So, I remember this particular English class on Homonyms from when I was in class 7. Our teacher fired words at us and we shot back with crisp sentences. 'Scale', came the word. "I used my scale to measure the width of the table. ", came a prompt response. Then, the class was lost for another meaning. I saw my opportunity, and blurted, "I want to scale the Mt. Everest." You know that smug feeling you get, when you get extra credit for doing something others couldn't. My face shone! When the feeling had subsided, I got thinking about how brilliant my answer was, and realized, although my answer had been deemed "correct", it wasn't really correct in the truest sense. If you think about it from a broad perspective, scaling the Mt. Everest is as good as measuring its height, as if with an actual scale! Soon, I found myself trying more and more to unify the meanings of Homonyms I came across. ... all of which brings me to chance. When we look back on our lives, we find how much of it was really based on chance. Chances we took, chances we got. Chances we gave, taking chances on something. On how many times we took chances on all the chances life gave us. On how we messed up some of the chances we got by taking an unreasonable chance. And that there was always a chance for the things that went right for us to go equally wrong. And when we look ahead into the future of our lives, and try to "plan" it, how we want one chance, just one chance, to turn our lives around! Or get another chance to make things right, which, it so chanced that it didn't go well the last time. You know, given a set of circumstances and understanding, we take a chance on the best possible chance we get, even when chances of success look grim. Chances are, Life will give you another chance, you just have to wait long enough, you will know when you get it. Or, if you have waited long enough, you'll know how to create one for yourself. Aur jab tak mauka naa mile, tab tak mocha se kaam chalaa lenge!